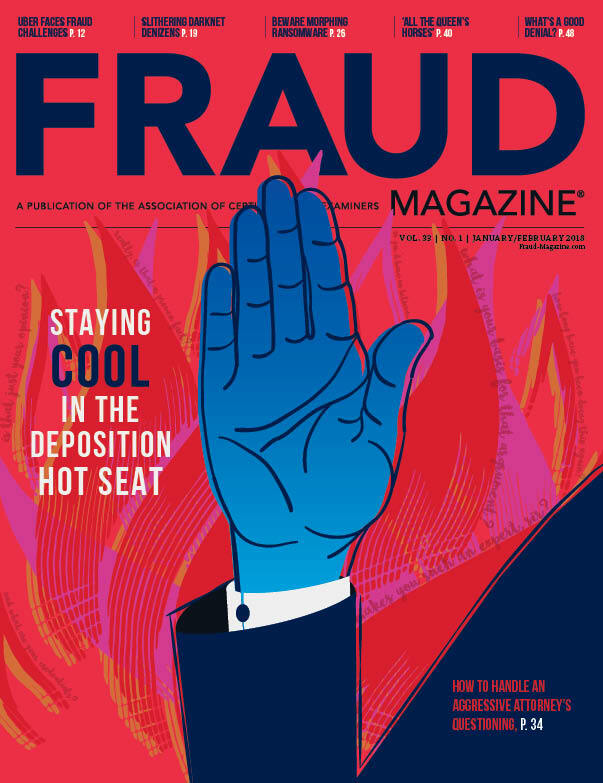 This article, the second in a two-part series, presents insights and best practice recommendations from CFEs and other experts on how to anticipate and respond to passive executive fraud, or nonfeasance, such as failing to prevent employees from engaging in illicit financial transactions. 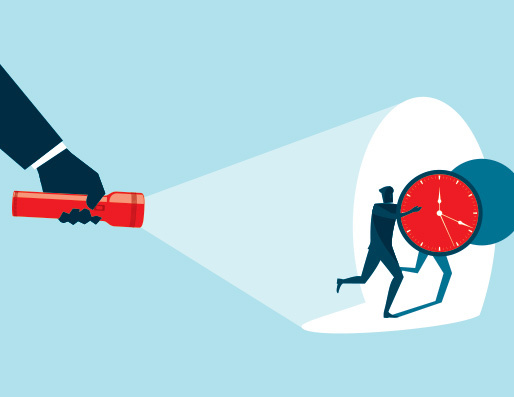 Part 1 explored techniques and tools that veteran CFEs and other experienced fraud fighters use to detect and prevent C-suite-initiated schemes, or malfeasance. To illustrate C-suite nonfeasance, this article cites recent examples from the real estate sector. As the biggest cog in America's economic machinery, it generates 13 percent of U.S. GDP. Perhaps unsurprisingly, money laundering in the real estate industry (MLRE) is vast and, some say, under-regulated. 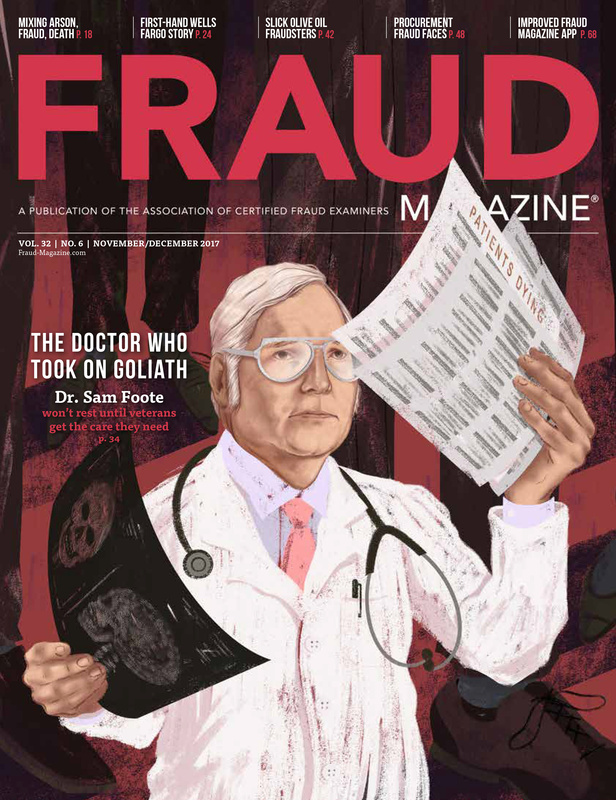 Here's a discussion of how CFEs can help its leaders — and those in all industries — actively fight fraud. Up to $2 trillion is laundered globally each year, says the United Nations Office on Drugs and Crime. Drug cartels, active in the U.S. and Mexico, are responsible for much of that total. Take, for example, the case of Freddy Centeno. (See the Dec. 19, 2013, FBI release, Real Estate Agent Headed to Prison for Money Laundering.) In 2011, he had a bright future as a licensed agent with ERA Real Estate, a vast international network of sales franchises. Centeno, working like most in his profession as an independent contractor, was a solid producer in ERA's Brownsville, Texas, office, on the U.S.-Mexico border. Then Armando Arambul of the Matamoros drug cartel approached him. When Mexico tightened its anti-money laundering (AML) provisions, the cartels looked for ways to wash their loot north of the border. Purchasing U.S. real estate through a straw buyer was easy, so Arambul made Centeno an offer he couldn't refuse. For a while, things went smoothly. Arambul transferred drug profits to Centeno, who used them to buy Texas real estate in his own name, then transferred titles to Arambul. Eventually, though, U.S. law enforcement caught up with Arambul, who admitted to laundering $5 million. He was convicted in 2013 on one count of drug trafficking and two counts of money laundering and drew a 14-year sentence. According to Angela Dodge, public affairs officer for the U.S. Attorney, Southern District, in Houston, the Arambul investigation revealed Centeno's involvement to federal law enforcement officers, who didn't charge anyone else with participating in the scheme. Centeno pleaded guilty and received a two-year sentence. Perhaps ERA could have detected his money laundering in real estate (MLRE) — but apparently it didn't. Yet even if ERA had suspicions, it isn't required to report potentially illegal activity. Its options are to ask no questions and reap profits; or assess and, if appropriate, voluntarily report suspicious activity and risk missing out on lucrative business. Around the same time, an agent's phone rang in the Related Group, a leading Miami real estate firm. The caller was interested in an expensive condo in a new beachside high-rise. She said she was a manager at United Parcel Service. Understandably, the agent was reluctant to waste time on an apparently unqualified buyer. How could a 9-to-5er buy a $2-million property? The agent's instincts told her the proposition was fishy. But she pushed her doubts aside and submitted the caller's offer. That gamble paid off. The deal soon closed, and everyone involved profited handsomely. Ultimately the UPS manager bought 10 more condos — all developed and sold by the Related Group. Meanwhile, when federal investigators in Florida arrested drug runner Alvaro López Tardón of Miami Beach and Madrid, Spain, they found he owned lots of local real estate. (See the Sept. 29, 2014, FBI release, Head of International Narcotics Trafficking and Money Laundering Organization Sentenced to 150 Years in Prison.) Also caught in the dragnet were several members of Tardón's gang, Los Miamis. They were longtime cocaine distributors in Europe and the U.S. and had laundered millions through the purchase of luxury goods, including Florida real estate. Tardón's girlfriend, Fabiani Krentz, the UPS manager, had used the drug profits to purchase properties on his behalf. The federal indictment of Tardón, Krentz and their associates listed numerous assets bought to launder Tardón's illicit gains: 17 cars, 15 condos and houses and 26 bank accounts — valued at $26 million. Of the 15 properties, the Related Group had sold and developed 11. The government seized them all, and in September 2014, Los Miamis' members were sentenced to prison — Tardón for 150 years. No one at the Related Group was charged. They had neither broken laws nor failed to comply with AML regulations, which didn't apply to them. But how could Related Group executives not be suspicious of a midlevel manager's ability to afford so much luxury real estate? 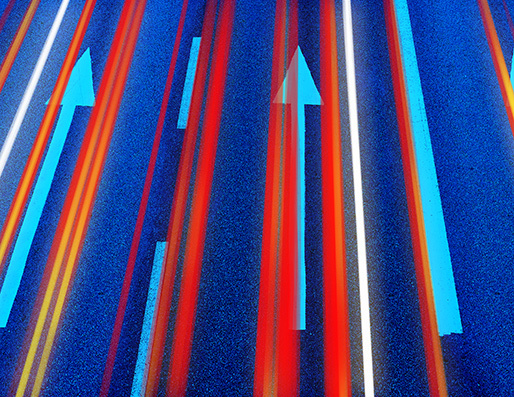 More broadly, how do corporate leaders in general feel about cutting corners to boost profits? Consider the results of Ernst & Young's 2013 Global Fraud Survey, which conducted 2,719 interviews with senior executives of large companies in 59 countries and territories. It covered a broad range of industries. Eleven percent of CEOs said that misstating financial performance is justifiable to survive an economic downturn. Of C-suite executives, 41 percent said they were willing to offer gifts, entertainment or cash to win or retain business. Three-fifths (61 percent) of C-suite executives hadn't attended anti-bribery and corruption (ABAC) training. Further, 72 percent of CEOs hadn't been asked to participate in an ABAC risk assessment by their company in the past two years. 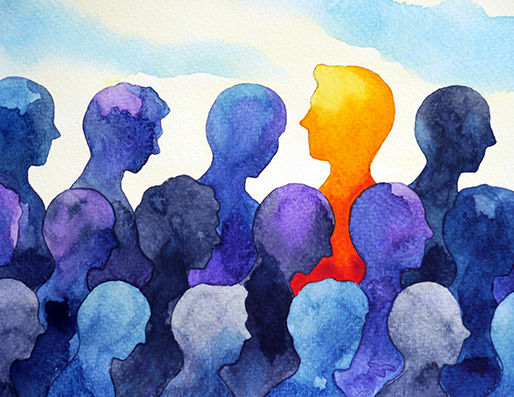 One quarter (26 percent) of C-suite executives, when asked whether their company's board of directors received regular updates on fraud and noncompliance allegations or investigations, said the question "does not apply." Nearly half (45 percent) of organizations surveyed lacked a whistleblower hotline. Ernst & Young said that the level of fraud reported by respondents has remained largely unchanged over the past six years. Because these findings represent industry broadly, the question is whether similar patterns exist in the real estate sector. It would be useful, therefore, to hear from leaders of firms that have experienced — if not committed — MLRE. ERA Real Estate, headquartered in Madison, New Jersey, has 31,000 brokers and sales associates in 2,300 offices in 46 states and 33 countries. 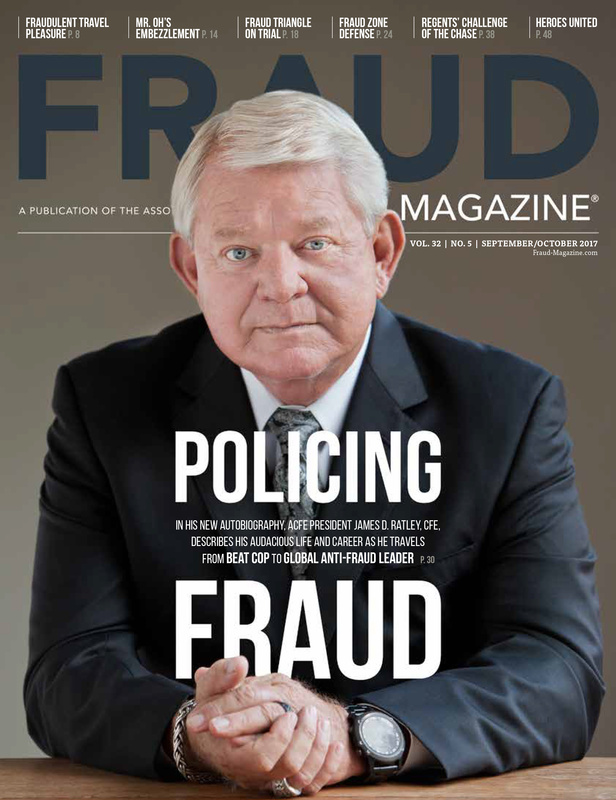 To understand how ERA manages the risk of MLRE as perpetrated by its former agent, Centeno, Fraud Magazine requested an interview with ERA President and CEO Charlie Young. But a company spokesperson said Young wasn't available and didn't respond to Fraud Magazine's subsequent request to discuss MLRE with any ERA executive. The Related Group of Florida, with a staff of 350, has built more than 80,000 condominiums and apartments. 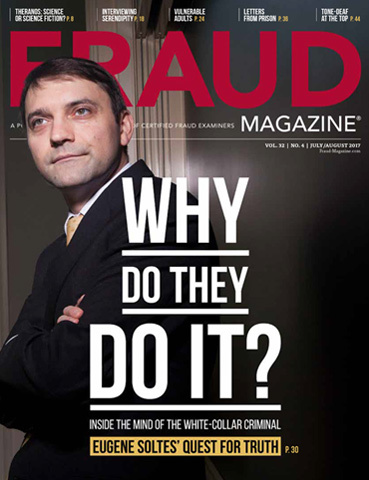 It, too, failed to respond to Fraud Magazine's request for an interview of its CEO, Jorge M. Perez. What, then, does the real estate industry's foremost trade group, the National Association of Realtors (NAR), say about MLRE? According to a paper on its website, Business / Money Laundering and Terrorist Financing, "Any risk-based assessment would likely find very little risk of money laundering involving real estate agents or brokers." This assertion arouses skepticism among some professionals with extensive real estate industry experience. David Long, J.D., CFE, is one of them. 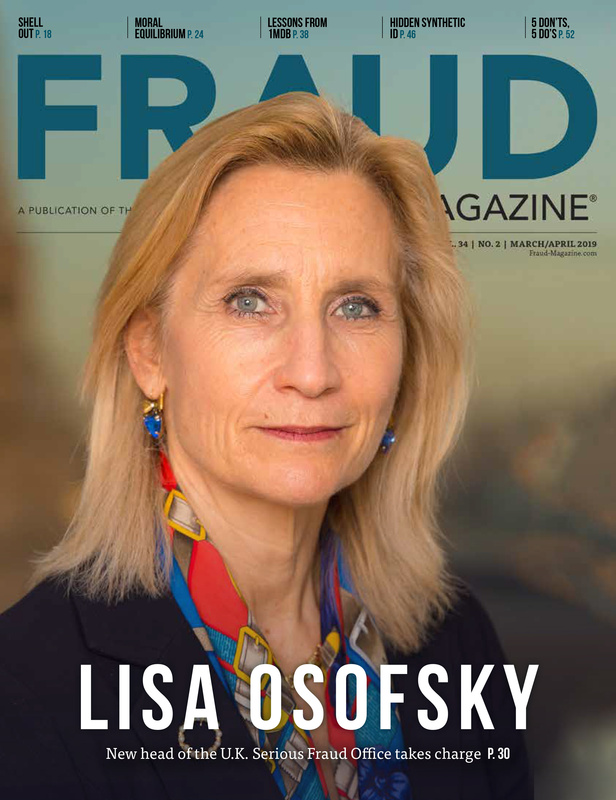 A principal of Northern California Fraud Prevention Solutions, a San Francisco AML consultancy, Long previously served as a federal white-collar crime investigator and also worked five years as a real estate agent in Los Angeles. Long says NAR issued voluntary AML guidelines for real estate professionals. He also says that NAR cites the Internal Revenue Service's requirement to file Form 8300, which all businesses — including the real estate industry — must file when they engage in transactions involving $10,000 or more in cash or equivalents. "But since compliance with NAR guidelines is voluntary, they're seldom followed," Long says. "At no time during my real estate career did I hear anyone mention money laundering or AML," he adds. Long stays in touch with his former real estate colleagues, who tell him that AML remains a low priority in their industry, despite the high risk of MLRE. As an example, Long describes the market in the San Gabriel Valley, east of Los Angeles. "It's not uncommon there to be approached by someone from China who offers $800,000 in cash for a house listed at $600,000," Long says. "That kind of buyer — and there are plenty of them — isn't concerned about the property's quality. He just wants to unload his cash in something safe and relatively liquid. With the real estate industry not subject to AML regulation, what more could a money launderer ask for?" Why, then, don't AML regulations apply to the real estate industry, as they do to banking and other financial service sectors? 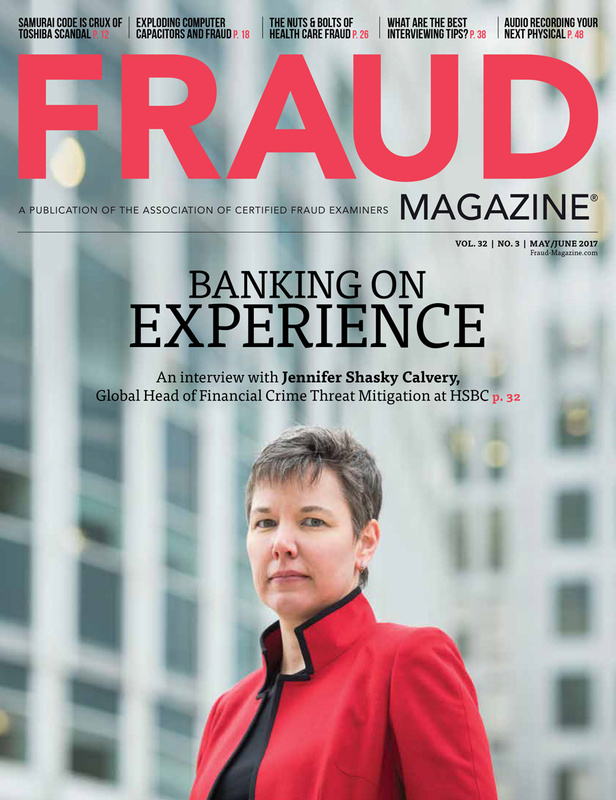 FinCEN Public Affairs Officer Candice Basso, in an email to Fraud Magazine, wrote that "[FinCEN's] approach to the risks of money laundering in the real estate industry continues to evolve and be guided by the insights from our law enforcement partners and from our analysis of the risks and vulnerabilities to money laundering and related financial crime. FinCEN will continue to consider appropriate regulatory actions to address vulnerabilities, including further application of anti-money laundering requirements where appropriate." To put Basso's reply in context, it should be noted that FinCEN, like other executive branch agencies, doesn't independently and entirely control its own regulations' scope or application, which in some instances federal legislation determines rather than the agency. The Anti-Drug Abuse Act of 1988, for example, expanded the definition of the term financial institution to include businesses such as car dealers and real estate closing personnel. That legislation, in turn, affected the manner in which federal banking regulators enforce rules related to the Bank Secrecy Act — the U.S.'s primary AML law. "Real estate is the only industry I've worked in where people are so frank about wanting to make money," Long says. "That's its culture, and it's why I believe FinCEN's AML regulations should apply to real estate, where the temptation for corruption is so high. Powerful real estate interests have successfully fought AML compliance. It'll come, but I don't hear anything about it happening soon." Are from a country with a reputation for money laundering. Are in a great rush to complete the transaction. 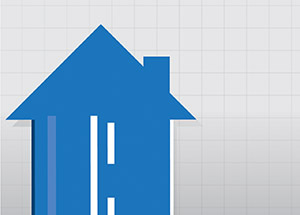 Show little interest in a property's distinguishing characteristics. Offer to buy a property for far more than its market value. Offer to pay an amount inconsistent with their reported income. Want to re-sell the property immediately after buying it. Louise I. Shelley, Ph.D., founder and director of the Terrorism, Transnational Crime and Corruption Center at George Mason University, says MLRE is a neglected crisis. "Since 9/11, regulators and law enforcement have scrutinized banks, wire transfer houses and virtually every sector except real estate, allowing MLRE to flourish," she says. Shelley, the author of "Dirty Entanglements: Corruption, Crime, and Terrorism" (Cambridge University Press, 2014), was the first co-chair of the Organized Crime Group of the World Economic Forum and is a lifetime member of the Council on Foreign Relations. "Many people in the real estate industry are unconcerned about where the money in big deals comes from," she says. "They just don't inquire much. Some don't inquire at all. But certain real estate agents are more central to this problem than others." As a researcher, Shelley is particularly concerned about the paucity of analysis being done on MLRE. "The only ones working on this are the Dutch," she says. "No one in the U.S. is studying MLRE." Shelley says the same is true of legislators, regulators and law enforcement in the U.S. and the EU. She uses the Tardón case in Miami as an example of how money launderers can afford to worry more about their investment return than about their detection and arrest. "Tardón was familiar with the real estate markets in Florida and Spain," she says. "Realizing that property values in Spain still weren't rebounding from the financial crisis, he converted his drug profits into Miami real estate, which was a much better investment." What would motivate the real estate industry to make more of an effort to detect and report MLRE? Shelley believes mandating its compliance with AML regulations would help a lot. "When money laundering becomes a risk to a business' own interests, it sets up a compliance office. A business that has been fined for noncompliance begins to behave differently," Shelley says. "But the real estate industry doesn't have to comply and therefore has neither been fined nor changed its behavior." If and when AML regulation extends to the real estate industry, it won't work unless it's applied to the entire range of entities participating in the real estate market. According to Regulating Luxury Investments, a 2014 Transparency International Policy Brief, many EU countries have extended AML regulations to the non-financial sector, but loopholes hinder their effectiveness. In the U.K., for example, real estate agents must perform due diligence on sellers, but not on buyers. "Governments should require AML compliance not just of the real estate firms, but also of the lawyers and others who set up LLCs and other front companies used in MLRE," Shelley says. "If you address just one part of MLRE, you're not being effective. The regulatory solution has to be comprehensive." Internal audit, corporate security and others track fraud, but corruption persists sometimes because of poor interdepartmental communication and cooperation. 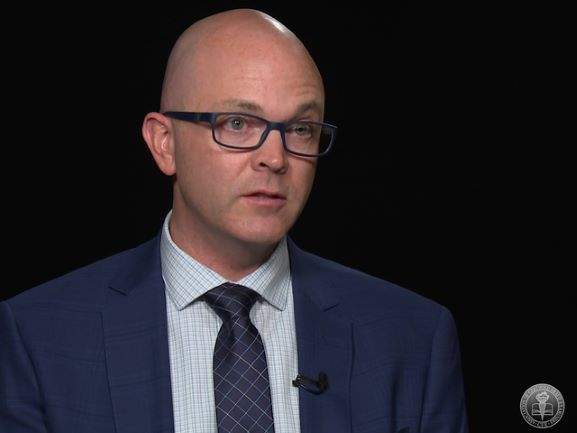 "CFEs can help make such teamwork an organizational priority," says Dan Barta, CPA, CFE, a financial crime specialist in the Dallas office of SAS Security Intelligence, a maker of advanced analytics systems. 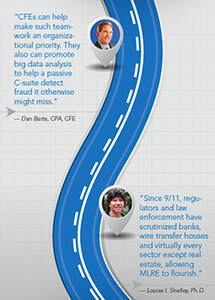 "They also can promote big data analysis to help a passive C-suite detect fraud it otherwise might miss." At ERA, Barta adds, executives at the parent company could perform comparative analytics on all of its franchise offices, potentially exposing any MLRE or other illegal activity. The approach should be multidimensional. "For example, compare Brownsville, Texas, not only to other south Texas offices but also to offices in Idaho and, over time, to itself," Barta says. "Looking at your data from multiple perspectives can give the C-suite and the board a comprehensive view of the organization's fraud risks." Finally, to help companies keep the C-suite on the straight and narrow, CFEs can focus clients on the Bank Secrecy Act's (BSA) so-called "four pillars" of AML, pages 44-54. While mandatory only for financial institutions, they also can serve as a practical model for others to emulate. Each pillar represents a component of an effective AML program. A system of internal controls to ensure ongoing compliance. Independent testing of BSA compliance. A specifically designated person responsible for managing BSA compliance. While all four BSA pillars are essential to effective AML, the last — training — is particularly important. Both the C-suite and the rank-and-file — if uninformed or unmotivated — can undermine an otherwise solid AML program. For CFEs, leading clients to mitigate this exposure is a professional responsibility and a hands-on business opportunity. Fraudsters will always have dirty gains to launder. Let's make it harder for them.